The goal of cryonics is to cryopreserve humans (whole bodies, heads or brains) so that future technology may one day restore those people to a youthful, disease-free and aging-free life. The means to this end is to reduce or eliminate the damage caused to tissues by freezing water. Cryoprotectants (anti-freeze agents) are the usual means to eliminate ice crystals, but many have speculated on the use of pressure. Many such speculations and discussions on the subject are collected here. For cryonics purposes, all forms of ice are to be avoided — and pressure is of value only when it can lower the temperature at which ice is formed. Because atmospheric pressure ice (known as ice-I) is less dense than water, application of pressure lowers the melting point — by about 0.55ºC per 80 atmospheres of pressure down to about -23ºC at 2,000 atmospheres of pressure. Powdered ice (snow) can be made to stick together as snowballs because of the temporary melting caused by application of pressure. Pressure helps melt the ice under the blades of ice skates, forming a lubricating layer (although most of the melting is due to friction). Pressure of heavy glaciers similarly assists movement. Above about 2,000 atmospheres pressure (about two kilobars) ice does not have the same crystal structure as it has at lower pressures. In fact, above 2,000 atmospheres there are at least 13 other crystal forms (designated by roman numerals II to XIV thus far discovered). Nucleation probability decreases without limit for ice I with increasing pressure, but pressure increase also increases the probability of ice III nucleation, which is why −23ºC is the lowest possible melting temperature (Tm) for any form of ice at pressures above 1,974 atmospheres. Nonetheless, at this pressure the homogenous nucleation temperature (Th) decreases to −92ºC, and water can be vitrified at reasonably achievable cooling rates [CHEMICAL REVIEWS; 102:2627-2650 (2002)]. Different crystal structures result from the application of high pressures causing increasing hydrogen-bond deformation. In the crystals of ice-VII & ice-VIII, each oxygen atom is surrounded by eight nearest neighbors (coordination number is 8) at 0.286nm (in contrast to four nearest neighbors at 0.275nm in ice-I). Ice-VII & ice-VIII are nearly twice as dense as ice-I. The hydrogen bonds are lengthened in these ice crystals, but each oxygen atom remains hydrogen-bonded to only four hydrogens. 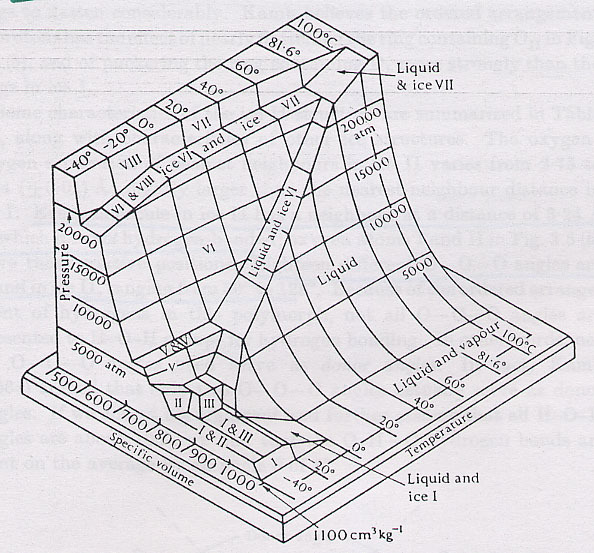 Ices II, VIII and IX cannot be obtained directly from liquid water, but can only be obtained by cooling or decompressing ices III, V, VI or VII. Cubic ice (ice-Ic) can be formed by cooling ices II, III, and V to liquid nitrogen temperature and then warming. Ice II can be brought to liquid nitrogen temperature with no changes in structure. Although high pressure can result in forms of ice that do not expand upon freezing (as ice-I does), phase separation could nonetheless result in damage due to high salt solute concentration. Accumulation of water molecules on solid surfaces at very low temperatures results in the formation of amorphous (non-crystalline) solid water. Comets are largely composed of amorphous solid water, which is probably the most abundant form of water in the universe. Low Density Amorphous (LDA) solid water (non-crystalline "ice") can form by cooling liquid water at a rate of 3 million ºC per second to -79ºC. If ordinary hexagonal ice (ice Ih) is cooled to liquid nitrogen temperature (-196ºC) and subjected to 2 GigaPascals (about 20,000 atmospheres) of pressure, it converts into a High Density Amorphous (HDA) solid. If warmed to about -148ºC the HDA will suddenly expand into LDA [SCIENCE; Soper,AK; 297(5585):1288-1289 (2002)]. (For more details on ice crystals, see Some Properties of Ice). The complete elimination of ice by vitrification (the formation of an amorphous, non-crystalline, highly viscous solidification) is a key element to cryopreserving brain and body surface in cryonics. Cryopreservation chemicals are used to prevent ice formation, and high pressure can assist. The freezing temperature of pure water or water mixed with cryoprotectant when no nucleating agents are present is called the homogenous freezing temperature (Th). The temperature at which a cryoprotectant mixture will become ultraviscous and become a vitreous solid (glass) without freezing is called the glass transition temperature (Tg). Amorphous ice or vitrified CryoProtectant Agent (CPA) can change from a vitreous liquid to a vitreous solid at a glass transition temperature (upon sufficiently rapid cooling) or at a glass transition pressure (upon sufficiently rapid application of pressure). At pressures of 2,000 atmospheres at the melting point temperature of −23ºC, water is as viscious as honey, and has a homogenous nucleation temperature of −92ºC. Increasing concentrations of CryoProtectant Agent (CPA) will lower Th and elevate Tg. Vitrification is feasible where curves for Th and Tg intersect. If this intersection can occur at lower cryoprotectant concentrations, vitrification can be achieved at minimum toxicity. High pressures can lower Th and elevate Tg of cryoprotectant solutions, allowing for the curves to intersect at lower cryoprotectant concentrations. 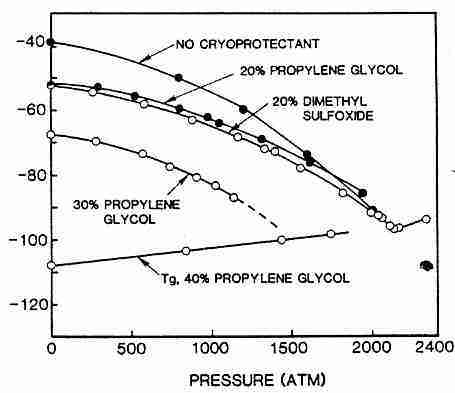 At about 1,600 atmospheres of pressure the Th curve for 20% cryoprotectant concentration intersects the Th curve for no cryoprotectant, meaning that no advantage is gained by the use of 20% cryoprotectant solution above 1,600 atmospheres. 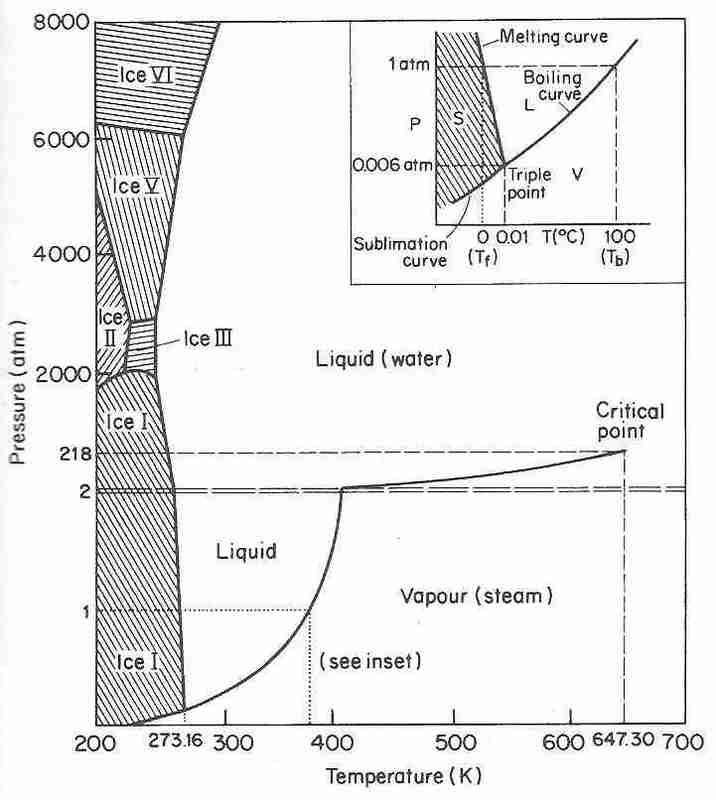 The relevance of this table is that as pressure is increased, the freezing point of water falls to a low of −22ºC at 2,700 atmospheres, and then increases to a +175ºC at 36,500 atmospheres. The main goal, however, is to avoid freezing. A judicious use of high pressure may be a means to achieve vitrification. The German cryonicist suggests application of about 2,000 atmospheres to a brain at a temperature of about −20ºC (above freezing point) followed by a sudden increase in pressure to about 20,000 atmospheres in less than one second. This might result in the rapid conversion of the brain to a solid state without ice crystal formation. Pressure could then be maintained as the brain is cooled to some suitable temperature (perhaps room temperature) for long-term, high-pressure storage. Or perhaps the brain could remain vitrified and pressure could be removed after cooling to cryogenic temperatures. A crucial factor in the removal (and application) of high pressure would be the stress factors (possible cracking or other mechanical damage) and volume changes. Remarkably, the figures the German cryonicist showed me suggest that for +60ºC at 20,000 atmospheres there would be very little volume change for water. (In possible contradiction, water at the critial point — 647.6 K & 217.7 atm — occupies 40% the 0ºC, 1 atm [STP] volume). Cryobiologist Dr. Greg Fahy froze kidneys at 1,000 atmospheres and found that this reduced viability — a problem that was not encountered at 500 atmospheres. Nonetheless, Dr.Fahy did not instantaneously apply pressure and he eventually released pressure — with both operations being potentially damaging. Dr.Fahy was concerned with viability due to his work on organ cryopreservation, whereas cryonicists are often more satisfied with simply reducing or eliminating structural damage. (Dr.Fahy later found that work on improving the effectiveness of cryoprotectants is far more fruitful and he abandoned high pressure methods — see Ben Best Replies below for more details.) Dr. Paul Segall has suggested that nitrogen toxicity could have been the problem. There are other damaging effects under high pressure. Supercritical fluids (under high pressure) have extremely high capacity for solvation. Carbon dioxide under high pressure is used as a supercritical fluid to solvate caffeine from coffee beans — resulting in decaffeinated coffee. If there is any fluid portion remaining at high pressure, there may be an increased solvating capacity for that fluid (the mechanism of solvation needs to be understood). Viability at high pressure is reduced by increased fat rigidity in cell membranes (which is why deep-sea organisms have more unsaturated fat in their membranes) and proteins become inactivated by agglutination of water molecules around charged particles and by osmotic effects. But none of these effects would matter if a solid state is rapidly achieved since the goal is solid biostasis, not a living (viable) state under high pressure. Only the supercritical fluid effect could be permanently destructive — but a solid state achieved rapidly enough could preclude such destruction. The problem of removing a human brain from the skull while keeping it viable could be difficult, but doing-so quickly at low temperature might eliminate the need for constant perfusion. As German cryonicist Klaus Reinhard has pointed-out, the Japanese researcher I. Suda must have had a similar procedure for his cat brains. Leaving the brain in the skull might be acceptable as long as there is no fracturing of the skull or collapsing of the brain into the upper part of the skull. I'm as aware as anyone that putting a brain under a pile driver will smash it to smithereens. But the issues of high pressure cryonics are more subtle than that. Pressure of 1 atmosphere is equivalent to 14.7 pounds per square inch. If you total-up the number of square inches of skin for a typical person, that amounts to tens of thousands of pounds of pressure. Why aren't we all crushed? Because the pressure is exerted in all directions and is therefore "self-equalizing". In the ocean, pressure increases with depth at a rate of approximately 1 atmosphere per 33 feet. Sperm whales regularly swim to depths of 3,700 feet (about 110 atmospheres) and there are fish living at depths 10 times as great (the bottom of the Mariana trench in the Pacific) at about 1,100 atmospheres pressure. The greatest danger to animals or fish occurs with change of depth — especially the formation of gas bubbles due to rapidly decreasing pressure. The most serious danger of high pressure is probably the collapsing of the lungs (pressure on a gas-phase space). Application of 20,000 atmospheres to a cubic foot of water would turn it into a solid state — greatly reducing molecular mobility. If the cubic foot of water contained a brain, the equalization of pressure in all directions could mean that the brain is simply turned into a solid state, without being "crushed". This assumes that all parts of the brain are equally compressible with water, which is probably a dubious assumption — despite the fact that the brain is mostly water and fat. Nonetheless, I think potential damages due to rapid application of pressure cannot be as great as those due to freezing damage. I like the simplicity of suddenly putting the brain in a solid state, but the fact that heat of fusion might drive the temperature to 60ºC (about 140º Fahrenheit) does disturb me. Such a high temperature could easily result in undesired chemical reactions, even if molecular mobility is greatly reduced. I think the same would be true of room temperature storage at high pressure. I think any high pressure techniques should be combined with low temperature technique. The German cryonicist also suggested a multi-stage approach. This would involve, say, lowering the brain/water cube to minus 20ºC at 2,000 atmospheres and then increasing pressure in one-thousandth of a second (I don't know where he got this figure) to 6,000 atmospheres. This might increase viscosity and increase temperature — but still to a sub-zero temperature. The sample could then be cooled again and the process repeated until a solid vitrified state is achieved. Unfortunately, I am not convinced that this iterative process would not result in ice crystal formation — I rather think it would. I believe that immediate use of high pressure would virtually guarantee reduction of freezing damage and increased viability. Greater use of electromicroscopy in connection with cryopreservation procedures will hopefully result in more appreciation of the distinctions between greater and lesser freezing damage. Freezing damage is not so much due to "puncturing of cells by ice crystals" as due to mechanical crushing resulting from the fact that ice is less dense than water — and the fact that water mostly freezes in the extracellular space. Very high pressure could eliminate volume expansion if pressure can be applied so rapidly that ice crystal formation is prevented. Phase transition to a solid state produced by cooling depends upon conduction — which means that it is necessarily so slow as to allow ice crystal formation. Phase transition produced by rapid application of very high pressure has the potential for producing vitrification by not allowing time for ice crystals (low density) to form. Such a procedure could conceivably be done without cryoprotectant — and thus without cryoprotectant toxicity. Ben Best's posting concerning high pressure cryonics contains some assumptions which could lead to consequences I don't think he anticipated. First, the reason that high pressure storage has been proposed is to bridge the gap between toxic cryoprotectant concentrations and vitrifiable cryoprotectant concentrations, using current cryoprotectants. Other cryoprotectants might not have this gap. Second, some practical engineering and physics considerations come to mind. If we assume fabrication of a pressure chamber of 22 inch diameter using steel at 100,000 psi yield strength and a storage pressure of 2000 atmospheres (30,000 psi), this results in a chamber with 3.3 inch walls. This ignores engineering practice and the question of the properties of steel (industrial strength) at liquid nitrogen temperature. Other problems are electrical and fluid feed-throughs. In a lot of ways this begins to look like a gun barrel. A recent example of this scale of fabrication was Gerald Bull's long range super cannon he was developing for Saddam Hussein! In particular the closure for this pressure vessel starts to look like a breech block. A question that come to mind at this point is: Do you store people at this pressure? In which case the cost of storage per person will be very expensive. Or, since at low enough temperatures, the high pressure forms of ice can be stored at atmospheric pressure, do you process them down to - 196ºC and then remove them in a metastable state and store them at atmospheric pressure in liquid nitrogen with attendant transfer complications? The crystallography of the high pressure forms of ice from X-ray diffraction studies was done this way. The ice crystals were formed at high pressure, cooled to liquid nitrogen temperature and removed from the pressure vessel at −196ºC in a metastable state and X-rays were taken. Unfortunately, a lot of energy is stored in the ice. There is probably somewhere an anecdotal account of dealing with "explosive ice". thus 30,000 lb/in2 X 0.08 in3/in3 = 2500 in-lb/in3 which after appropriate conversion results in a value of 67 cal/in3 or 4.2 cal per gm. 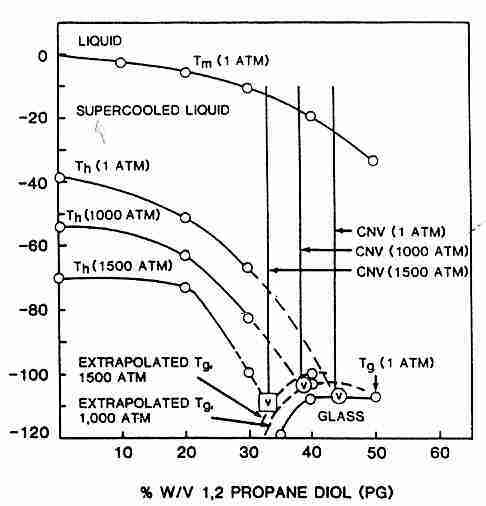 For 14,000 atmospheres (another figure mentioned in Ben's posting), a vessel of 23 inch steel walls results, again ignoring engineering practice and strength vs. temperature. The bottom line is that this is not a trivial project and can have some rather novel consequences. The resources that would have to be devoted to it would almost certainly be better expended in other directions. Incidentally, I at this point do not share Bob Ettinger's confidence that cracking is not a problem for liquid nitrogen cryostasis. Although he may in fact turn out to be right, there is still work to be done in this area before we can reach that conclusion, (work which is still in progress here at Alcor). I reproduce here a graph of heat capacity for ice. Heat capacity is defined as the amount of heat required to raise a quantity of material — typically a mole — one degree (K or ºC) at constant pressure (Cp) or constant volume (Cv). The graph shows Cp in Joules/mole-K. Hugh's figures are for amount of heat per gram of material, more often called specific heat. Liquids can be vitrified either by rapid cooling (with or without cryoprotectants or network-formers) or by application of pressure. At atmospheric pressure selenium melts at 220ºC, but at 40ºC and 11 kilobar (about 11,000 atmospheres of pressure) selenium displays a glass transition pressure (Pg) at which there is a 40% decrease in compressibility and a similar change in thermal expansivity — which leaves selenium in a vitrified (glassy) state. Unlike (2) & (3), which rely on ice being less dense than water, this method (the German cryonicist's idea) presumes the formation of a vitrification solution which is more dense than water. Hugh Hixon entirely misses the point when he refers to "ice crystals formed at high pressure". The whole point of this procedure is to apply pressure so rapidly that the solution does not have time to form ice crystals. Moreover, a vitrified solid of tissue could be formed in this way without the need for (and toxicity of) cryoprotectant. However, this requires pressures in the order of 14,000 atmospheres, which could be quite technically challenging, as Hugh Hixon points out. Also, even though a vitreous solid (rather than ice) is formed, I think Hugh makes a very good point about the metastable state — a factor I had not considered. The vitrified solid would be potentially "explosive" due to its high density, and yet brittle and vulnerable to cracking (just like glass). Possibly the cohesive forces could adequately exceed the explosive forces, and there would be no problem. As noted above, at least some high pressure ices can be cooled to liquid nitrogen temperature and uneventfully depressurized. A pressurized vitreous material may be just as safe. Psychologically, it is difficult to think in terms of a low degree of "explosiveness", but I believe this may be the situation. Otherwise, it would be necessary to maintain the pressure. Since the solid is super-dense, it could maintain the inertness of a liquid nitrogen-stored solid at higher temperatures. But liquid nitrogen would probably be the most economical means of cooling. I must also acknowledge that the extreme high pressures required for this technique are bound to cause tissue damage and result in loss of viability. The differential compressibility of tissue substances and conformational changes with some enzymes and proteins are inevitable. Nonetheless, I believe that the structural damage would still be considerably less than the damage due to cryoprotectant toxicity and freezing damage. Nonetheless, quantifying and comparing this damage should be attempted experimentally, not simply on the basis of speculation. If freezing point can be lowered, cryoprotectant can be introduced at a lower temperature with the tissue still liquid, but with the cryoprotectant less toxic. This could be of particular benefit for DMSO since it is far less toxic at low temperature and it perfuses cells so much better than glycerol. I would like to see work on this, in fact, this was work I had hoped that Dr. Greg Fahy would do. But he had no interest in this. He introduced cryoprotectant near 0ºC and then applied pressure. He found that pressures greater than 500 atmospheres reduced viability (by denaturing proteins). Because 500 atmospheres only lowers freezing point by 5ºC or so, he didn't think the cost was worth the effort. It is undoubtedly also more technically difficult to introduce cryoprotectants under high pressure than to introduce cryoprotectants and then apply pressure. Since Dr. Fahy was achieving such great success with his cryoprotectant cocktail, it's not surprising that he lost interest in the (technically difficult) high pressure methods. Since ice is less dense than water, the application of pressure during cooling can inhibit ice formation. As was mentioned, this is the approach Dr. Fahy evidently experimented-with. The benefits of this approach did not justify the costs for him — especially given the fruitfulness he was seeing with improvement of the cryoprotectant cocktail and the re-warming protocol. If this is true, I would agree with Hugh Hixon (and Brian Wowk) that "the resources that would have to be devoted to [high pressure methods] would almost certainly be better expended in other directions." I don't think that mechanical damage of tissue is the crucial problem with very high pressure cryonics, although protein denaturation and damage due to differential compression is likely. I believe the key problems needing investigation are heat-of-fusion and developing manageable equipment at a reasonable cost. If money for research were unlimited I would like to see high pressure techniques (and many other techniques) studied thoroughly. As things stand, cryoprotectant research still appears to be the most cost-effective research program for cryonicists due to high equipment costs and the technical difficulties posed by the equipment. (See A Summary of the First 21CM Seminars and The Hippocampal Slice Cryopreservation Project). "The purpose of these schemes is to reduce mechanical injury from ice, either because one vitrifies (which will NOT happen) or because one forms non-expanded forms of ice, which are supposedly less harmful than that nasty old 9% volume increment caused by ordinary freezing. But these high pressure schemes would only INCREASE damage over conventional approaches because they would tend to nucleate ice inside cells, which is highly damaging structurally, and to do so near the freezing points of these solutions, where ice is extremely mobile and able to reorganize itself, in the process literally grinding up intracellular structures. Even if ice did not nucleate in cells, the high pressure treatments discussed can be expected to break cell membranes, which is not only damaging in itself but also permissive of the growth of extracellular ice into the cell, again shredding the cell. Finally, there is no evidence that the 9% volume increment associated with freezing has anything to do with freezing damage, despite the large amount of ill-informed speculation." The 9% volume increment argument is a half-truth, at best (more likely, a tenth-truth). Liquid water has a density of 1.000 and ice has a density of 0.9168, therefore ice occupies a volume (1.000/0.9168)x100 = 109.08% — 9% greater than water. Well, of course, we want to vitrify, not form ice. Yes, it is true that if too much water is lost from the cells, viability will be lost due to protein cross-linking of proteins inside cells. But emphasizing the number "9%" leaves the implication that a 10% loss of water will result in loss of viability due to cross-linking. The argument covertly implies a precision required by the vitrification process which would be difficult to achieve. But we already know that golden hamsters can loose much more than this from their neurons, since they experience neurological recovery after a 60% freezing of their brain water. The criticism of the German cryonicist's central idea, however, inspires me to believe that it is even more plausible than I previously thought. One of the major problems I saw with his idea was my conception that rapid application of pressure to force vitrification would lead to a 60ºC temperature rise due to heat-of-fusion. But vitrification does not involve heat-of-fusion. And much adiabatic heating can be avoided by gradual application of pressure (initially, at least) in conjunction with external cooling. This process could first bring the sample to -22ºC and 2,000 atmospheres — because this temperature and pressure would increase viscosity and thereby inhibit nucleation. If rapid cooling causes vitrification, it seems plausible to me that rapid application of pressure could do the same thing — at above Tg (Tg = transition temperature, ie, the temperature of vitrification for a cryoprotectant solution) for unpressurized rapid-cooling. Since Tg is a function of cooling rate, there is no reason why it could not also be a function of pressure-application rate — or some combination of the two (plus cryoprotectant). It is known that pressure distorts the ice I lattice from its ideal tetrahedral orientation, and this could be important in preventing nucleation. I can't say what rate of pressure-application would be necessary, nor how much pressure would be necessary for vitrification, but it would probably be less than my original guess. My thinking behind the 14,000 atmospheres was entirely motivated by the heat-of-fusion idea. But my physical intuition tells me that extremely rapid application of pressure would result in vitrification by cramming the water molecules together so rapidly that they would not have time to nucleate. The fact that Tg is so far below the freezing point at one atmosphere is based on the concept of vitrification by rapid-cooling rather than by rapid application of high pressure. PVT phase diagrams are no better for indicating the potential for vitrification by rapid-cooling than they are for indicating the potential by rapid application-of-pressure. High density amorphous solid H2O is slightly more dense than liquid water. The potential advantage of vitrification by rapid pressure-application over vitrification by rapid cooling is that pressure can be immediately propagated to the center of the specimen, whereas temperature change must slowly diffuse inward. The rapidity of the process might even not leave enough time for enzyme denaturation. The downside is the possible structural damage due to differential compressibility under high pressure (not due to nucleated ice in cells — which would not form in conditions of vitrification induced by rapid-pressure) and the probable cost of the necessary equipment. Although the costs would probably be substantial, I don't think they would be comparable to that of lofting a cryonicist into orbit. But since it appears that cheaper methods have so much promise, there is probably little reason to bother with the expense and potential damage of high pressure techniques. Both articles [1, 2] mentioned by Douglas Skrecky in CryoMessage #17788 seem to me of great interest for cryonicists. In fact, the method, now known as High-Pressure Shift Freezing was (AFAIK) first applied experimentally as long ago as 1967 by Maxim Persidsky in an attempt to preserve a canine kidney [3,4]. The kidneys exhibited less signs of tissue deterioration than kidneys, frozen by any other method, but still were not viable. I don't know about any subsequent attempts in this direction. Later the method was re-invented under the name HPSF in order to achieve high-quality preservation of food. Today the area is under a rather extensive exploration; the outcome is mainly presented in "Journal of Food Sciences" and "Food Technology" (see list of references in ). It is hardly practical to store either food or human bodies at 2100 atm; as well, −22ºC is far from the temperatures of interest for cryonicists. But the good news is that when pressure released - and that can be done very quickly - we get the water in the sample being supercooled to -22ºC at atmospheric pressure. 3. Uniformly distributed all through the sample. So, the damage from ice crystals will be much less than in case of surface cooling. Not all of the water will freeze. Since the freezing produces much heat, the sample will warm to 0ºC when about 29% change into ice **. So, HPSF only is not sufficient for cryonics. Usage of cryoprotectants. In fact, application of pressure can reduce the necessary concentration of cryoprotectant by 0.29, for example from 27% to 19%. Cyclic freezing. Persidsky [3, 4] used combination of cryoprotectant (15% DMSO) and several compression - cooling - releasing cycles. Supercooling. The temperature of homogenous nucleation (the ultimate temperature to which water can be supercooled) goes down from -40ºC at atmospheric pressure to -90ºC at 2100 atm . So, in theory, water can be cooled down to -90ºC without crystallization. In this case the heat of phase transition will not be enough to warm the water to 0ºC and it will all change to ice immediately after the release of the pressure. Usage of cryoprotectors and ice-blockers may help to achieve the necessary degree of Supercooling. Of cause, any combination of these methods is possible. Another possibility is to use vitrification rather than freezing. Under high pressure the viscosity of water greatly increases, up to 1500 times at 2100 atm , thus greatly reducing the nucleation rate. The high pressure method allows specimens up to 0.2 mm thickness with a total volume of ~1 mm3 to be vitrified without any cryoprotectants at cooling rate of 200ºC/sec (vs. 10000 ºC/sec at atmospheric pressure) . And, as in case of supercooling, cryoprotectors and ice-blockers may help. High pressure can as well be used on the thawing stage to reduce the recrystallization. Bad news is that application of such pressures as 2000 atm leads to denaturation of some proteins . It is hard to say now whether this kind of damage is inappropriate for cryonics purposes - as compared to crystallization, osmotic shock, cracking etc. It is possible, that more compression - cooling - releasing cycles with say, 1000 or 500 atm pressure will do better. Of course, 2100 atm chamber for whole body will be rather an expensive piece of equipment. But, if they can afford it for food processing, can't we afford it for processing ourselves? ** In fact, one should consider the total thermal capacity of the sample/body rather than just capacity of water. So it may take much more than 29% of water to crystallize to warm all the tissue to 0ºC. 1. L. Otero, P. D. Sanz, "High-pressure shift freezing. Part 1. Amount of ice instantaneously formed in the process", Biotechnology Progress, 16(6):1030-6, 2000 Nov-Dec.
2. P. D. Santz, L. Otero, "High-presssure shift freezing. Part 2. Modeling of freezing times for a finite cylindrical model", Biotechnology Progress. 16(6):1037-43, 2000 Nov-Dec.
3. M. D. Persidsky, V. Richards, "Cryopreservation of Organs in the Absence of Thermal Gradients", Cryobiology, March-April, 1967, pp. 375-376. 4. M. D. Persidsky et al., "Dog Kidney Cryopreservation Under Thermal Gradient-Free Conditions", Cryobiology, March-April, 1968, pp. 264-265. 5. "HPM 010 High Pressure Freezing Machine"
I've also forgot to mention the High-pressure biotechnology in medicine and pharmaceutical science by Patrick Masson, Carole Tonello and Claude Balny (Journal of Biomedicine and Biotechnology, 1:2 (2001), pp. 85-88). I've already posted it's abstract in CryoMessage #18392 the paper presents a good survey on effects of high pressure on the living matter & denaturation of proteins etc. Please add it to the list of references as . You say you don't know of subsequent attempts in the direction of using pressure to cryopreserve kidneys, but Dr. Gregory M. Fahy actually pursued this route. His original top vitrification solution was worked only at high pressure — he called it VS4 (Vitrification Solution 4). However, then he developed VS4-1A — so called because it worked well at one atmosphere pressure. Since then he has continued to develop increasingly better cryoprotectants that do not require high pressure to work — so he has abandoned high pressure methods at 21st Century Medicine (21CM). Dr. Fahy actually patented this idea in 1985. It is Patent 4,559,298. Interestingly, he found that some cryoprotectants also act as baroprotectants. Specifically, kidney tissue was damaged by 685 atm of pressure, but was undamaged at 1030 atm when treated with 30% DMSO or 30% (DMSO+Propylene glycol). His best procedure was to slowly equilibrate the biological system with vitrification solution at temperatures close to 0ºC then suddenly increase the concentration to 35%-50% (the concentration needed to vitrify). After some more time the system was placed in a high pressure chamber and the pressure quickly raised to 500-2000 atm and the temperature was lowered as quickly as possible to -130ºC. Pressure is then slowly released and further cooling is very slow (less than 0.5 degree C/minute to a final storage tempeature of -150ºC to -200ºC with some "annealing" at -140ºC. His optimum cryoprotectant solution at that time was a mixture of 17.5% DMSO, 17.5% propylene glycol and 6% PVP (polyvinylpyrrolidone). Note that this approach uses pressure to assist cryoprotectants, in contrast to the use of incredibly high pressure applied extremely rapidly to an already pressurized system suggested by the German cryonicist — without any use of cryoprotectants. Note also, that pressure methods of some kind may yet find application if only a small amount of additional assistance is needed to assist some cryoprotectant in the cryopreservation of some tissue.